Dev branch for anyone that wants to play with the cargo towing. 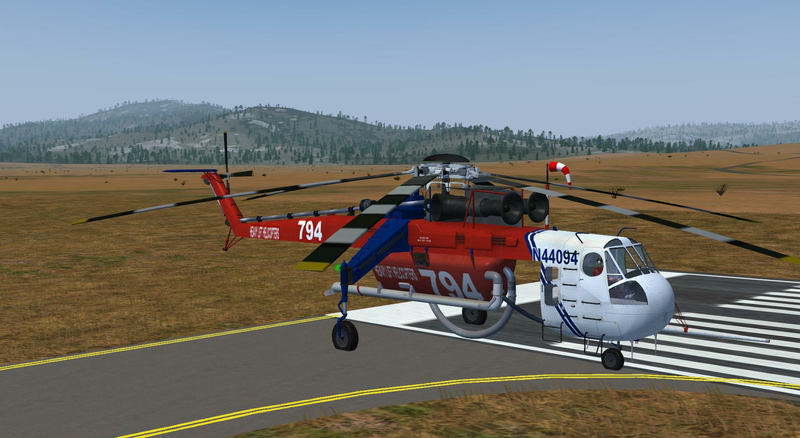 Here is the latest iteration of the proof of concept for the AirCrane long-line cargo hauling. I think visually this is getting pretty close to what I envisioned for this feature. I'd like to finish the logic for dragging the cargo on the ground, and possibly some kind of visual for a slack rope. All in all though I think it is pretty close. 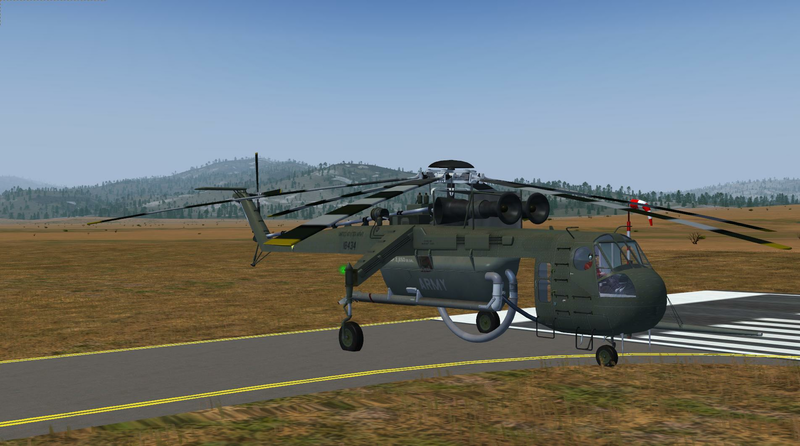 New liveries available in the development repository courtesy of N-SCOT! Thank you N-SCOT. There are a few more Army liveries not shown here. Awesome stuff there, thanks Gary and the others! FYI: I added flghtrecorder components to the dev repo version. 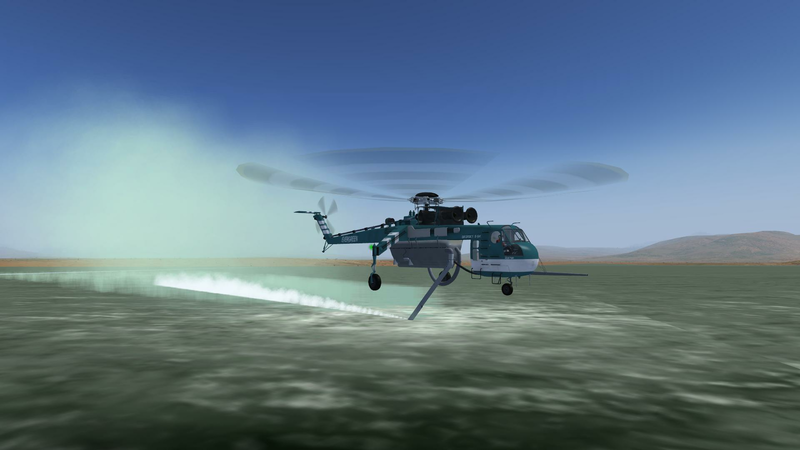 It now records most everything including the pumping tank animations, particle effects, rotor blade and gear animations. One thing I noticed is the "Wildfire" smoke and fire animations don't record. Anyone know how or if that can be made to record? Also, I did some work on the new liveries. The tires and rims were all an unrealistic shade of gray so darkened the tires and rims to a more realistic look. It's hard work keeping the wheels out of the water. 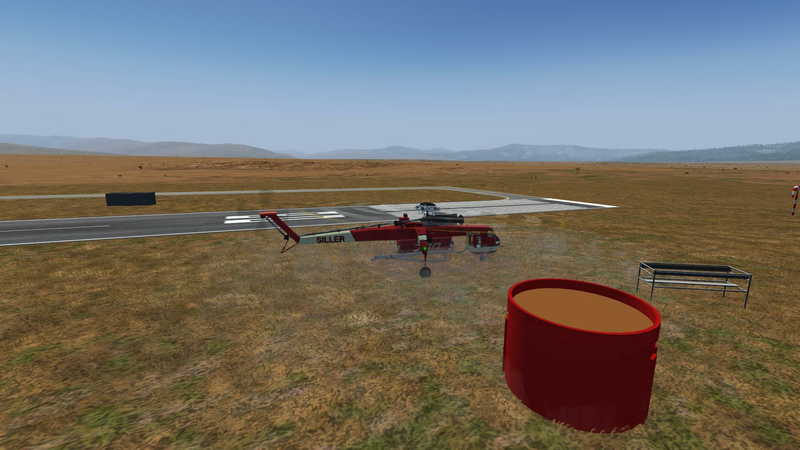 wlbragg wrote in Thu Sep 28, 2017 6:27 am: Here is the latest iteration of the proof of concept for the AirCrane long-line cargo hauling. You are getting closer and closer to making something like this possible. Believe it or not that very concept, although I think it was a different video from a different perspective and in clear weather, is what initially gave me the idea. I was awestruck at the skill presented in those videos. That scenario is indeed my ultimate goal. Now I've dabbled with the tank map, the tanks can match. yay! Several more to do yet tho'. It would be awesome if the US Army units had a deployment module to move around... kudos to anyone who would make it (and I'd paint it). ...and I will hook it up to the GUI, animate any movable objects and add a docking scenario or capability. 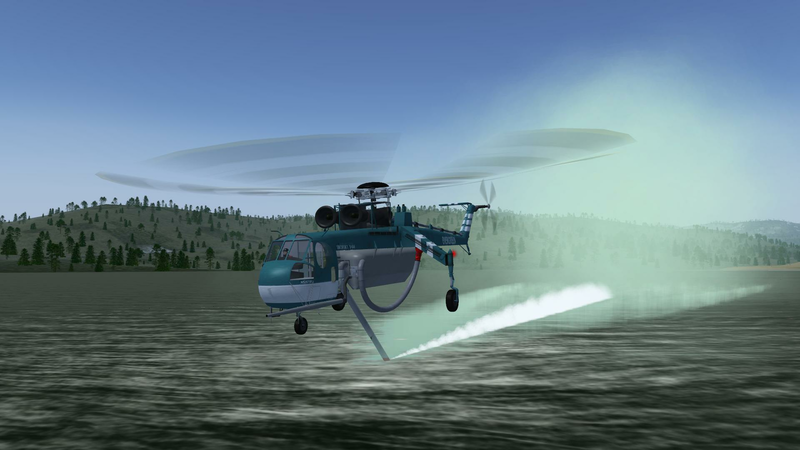 Thanks again N-SCOT, the new water pumping system liveries are installed and pushed to the dev repo. Can someone show us how it is done? Submerge the sniffer hose in the Foscheck holding tank without breaking through the sides. It will take a very steady control. The new holding tank has been pushed to the dev repo along with a stand for the pumping tank. I don't have any mechanism programmed yet for recording the volume or weight of Foscheck pumped from the holding tank. Nor do I have any animation programed yet to place the pumping tank on the stand. I plan to do both eventually. Also plan to make some new visuals for the filling and dropping of different materials from different tanks. Such as Foscheck and other fire retardants and liquid grass seed mixture. Or anything else we discover along the way. For now the holding tank and the pumping tank stand are added to the scene like any other cargo, using the AI interface instructions. 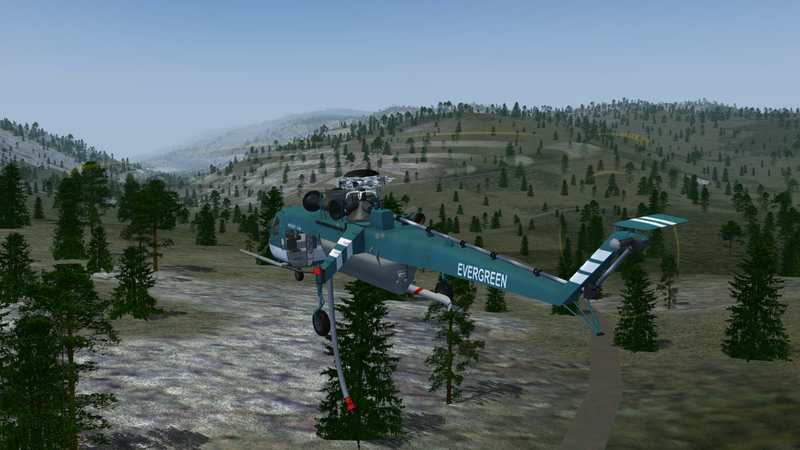 There is two additional entries in the aircrane_cargo.xml scenario file and two additional flightplan files aircrane_cargo5.xml and aircrane_cargo6.xml. These new objects will eventually be made to be hauled like any other cargo, however the visual for that is not done yet. My first attempt at filling the tank with retardant. Here is your next challenge. See how fast you can load all 5 pine tree bundles into the truck. I pushed a major change, enhancement and cleanup to the cargo hauling capability. I added a harness capability to all long-line hauled cargo which I think adds a nice touch to the effect. I also reintroduced the rope laying on the ground routine that was an original part of the flexhose animation created by Thorsten. All in all the long-line animation is looking good and working well. There are a few more animations I would like to implement before I call it finished but I think it is getting close.